Come early 2014, Bajaj Auto would become the first Indian automobile company whose India-made motorcycle would burn rubber in the US. The Indian motorcycle maker would manufacture street bikes for its Austrian partner, KTM AG, which has so far been selling only off-road bikes in the US. The stylish, high-performance and race-oriented bike model, KTM Duke 390, would be produced at Bajaj’s Chakan plant, near Pune. The US is the world’s biggest market for high-end super bikes (above 990cc). However, the ongoing financial crises have forced consumers to scale down to more affordable, efficient and easy-on-pocket products. The Duke 390, to be launched in Europe by the middle of this year, followed by India, before the US, has been developed under a joint programme of Bajaj and KTM engineers. Its concept was developed in Austria, while everything else, including design and final product development, was done in India by Bajaj. Before this, Bajaj Auto, which owns stake in KTM, successfully launched two models — Duke 200 and Duke 125 — which were built and sold in India and exported to Europe and other markets. “What we are talking about are powerful (40-44 bhp) but affordable bikes; at 138 kg, these are powerful and agile. With a target price of ^5,000, including VAT, we think it could be a big success,” he adds. Riding high on India-made smaller bikes, KTM dethroned German giant BMW last year to become Europe’s largest bike maker, with sales of 107,000 units, as against BMW’s 106,000. The plan forward is to rapidly ramp up production from India and simultaneously hunt for newer markets in the Asean region and Latin America. In some Asian markets, Bajaj has a strong network of its own, while in others it taps into resources of its other partner Kawasaki. Similarly, the Pune-based bike manufacturer, India’s second-biggest, has a strong infrastructure in Latin America, too. Pierer sees a multi-fold increase in production from Chakan in the next five years — to at least 100,000 units a year from 17,000 as of last year. This would be half the total expected output for KTM globally by that time. “We would produce 200,000 units a year; of that, 100,000 would come from India. 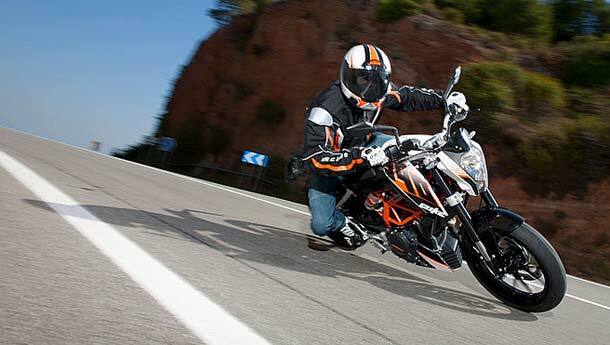 We expect sales of 10,000 Duke 390s in Europe and the US. India and other regions would be additional,” Pierer adds.